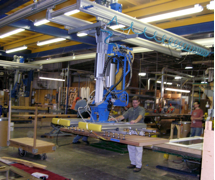 AL Systems™ Workstation Cranes Applications | EMH, Inc.
Click to return to AL Systems™ page. 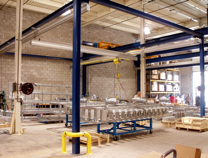 A builder of components for the power transmission industry utilizes a conventional freestanding single girder system to safely handle high value loads. A freestanding lamppost style systemallows workstation placement in the most convenient and efficient location.This frame consists only of four upright columns per runway cell. The crane runway is clamped onto the top of the frame at the corners using standard AL clamps, and the bridge and lifting devices are then hung from the runway.Maximum overall height is 15 feet (shown in photo). 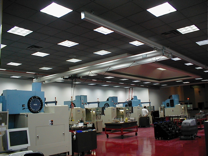 A ceiling mounted double girder system moves machined parts among workstations. Runway supports are mounted above ceiling tiles for a clean, uncluttered appearance. 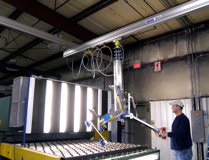 This AL System™ is used in the production process at a Midwestern boat glass plant. 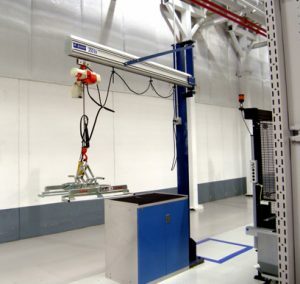 A Midwestern manufacturer of automotive components uses several EMH cranes in its production processes. Show above are a lamp post style freestanding system and a pillar-mounted floor standing jib. 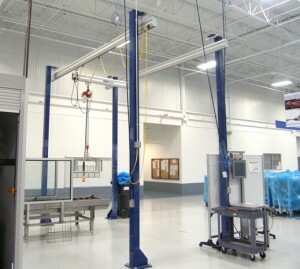 A double girder AL System™ is used to precisely position doors on hinges at a high-end door manufacturer.